On March 8th 2018, Women’s Day was celebrated across our projects with vigour, enthusiasm and passion. At our Emergency Care and Recovery Centre, we were honoured to have Ms. V Rukmani Priyadarshini, the Superintendent of Puzhal Prison as our special guest. We began the programme with a prayer song, after which some of our long-term residents shared what Women’s day meant to them. Ms. Rukmani shared a story and motivated our clients and residents to do the same. Clients shared their experiences; stories of hardship, struggle and resilience. These women described what their journey at The Banyan has been like, and how they feel that their lives had been transformed. They expressed their gratitude towards members of the staff that they look up to. The health care workers at the ECRC also were given the opportunity to speak about their jobs, many expressed that the work they are able to do gives meaning to their lives. The event culminated with a presentation of awards, as a token of appreciation, to our clients to celebrating their commendable traits and hard work. Gold and white sarees were glittering in the sun. Broad smiles were spread across the faces of the residents and staff, alike. There was excitement in the air the day Onam was celebrated at The Banyan’s co-housing facility, the residence of several long-term clients of the organisation. One resident, when handed the Kerala saree she had spent her own salary to buy, bubbled up with joy. She can’t speak, but expressed her delight by enveloping the health care worker who had just handed it to her in a huge hug. Their laughs reverberated through the room. Many of the residents living at the home use their income to buy things for occasions such as this one. They earn their pay through participating in vocational training activities or jobs from block printing, basket weaving, beading necklaces, to cooking food and working as assistants in the convenience store or library. And as I saw the morning of Onam, they are nothing short of delighted when able to enjoy the harvests of their hard work. The Onam Festival is traditionally celebrated by Hindu-Malayalis, however at The Banyan these confining boundaries of identity are constantly being broken. On this day, I witnessed not just the Hindu residents from Kerala participating in the festivities, but residents from northern and southern India and residents from Hindu, Muslim and Christian backgrounds. The Banyan Academy of Leadership in Mental Health (BALM), a combination of a research facility, a capacity building establishment as well as an educational organisation that offers three full time master’s programmes (Social Work, Clinical Psychology and Counseling Psychology) is located in the same site as the co housing home. Many of the residents who live at this group home don’t have the ability to speak and thus can have a difficult time communicating their needs- especially in times of distress. However, the staff, students and faculty maintain a demeanor that is patient, calm and kind; constructing a community that is built on affection, understanding and care. This integrated space is a perfect example of the values that are implemented here at The Banyan. Regardless of class, religion, diagnosis or position at The Banyan, everyone is treated with equal compassion and respect. At the group home, the occasion was commemorated with a programme organized by the BALM students, which included performances of Malayali songs and dances. The residents of the Urban Shared Housing program competed in a Pookolam competition and joined the staff and clients at the Transit Care Centre to celebrate the occasion with them. Furthermore, students from a local college visited the Transit Care Centre and spent time with the clients and staff playing games and of course, enjoying a special Onam Sadhya meal. The Banyan celebrations that took place in Kerala, the birthplace of the festival, were even more colourful. All the staff and the residents of the Home Again program there gathered at the Kerala office and together, and spent two hours creating a very large Pookolam after which they enjoyed a potluck style meal paying tribute to both Onam and Eid. In a beautiful show of hospitality by the neighbours who live beside the Home Again project homes in Malappuram and Calicut, invited the residents to attend their family celebrations of both Onam and Eid. What’s more, the Home Again program residents also attended a government school in Mallapurram’s annual Onam celebration as the chief guests. The celebrations that took place for Onam and Eid in Kerala this year provide a wonderful example of how the Home Again initiative created by The Banyan can help those with mental illness assimilate with their social surroundings. This not only allows for an improvement in well-being through added social interaction and support, but inadvertently improves understanding of mental illness and decreases stigma in the neighbouring communities. For me, a recent addition to The Banyan, the highlight of the Onam festivities took place when the BALM students called for everyone- residents, staff and faculty- to come on stage and dance with them to the lively Malayali music. Despite the fact that it was my first week, many of the health care workers at the co-housing facility, pulled me on stage to dance alongside them and the residents. The cheer that spread through the auditorium in that moment made me feel warm, and that I was already part of The Banyan family. The story of Onam is a story about community. King Mahabali was one of the most successful kings of his time, and legend has it that his kingdom was very prosperous and all of his subjects adored him. He was known for his kindness and his generosity, and his success was so great that it made even some of the gods jealous and fearful of his power. On account of their fear, the gods begged Lord Vishnu to rid the world of Mahabali, and he agreed. He disguised himself as a dwarf Brahmin, Vamana, and approached king Mahabali. The king ignorant of his true identity, took pity on Vamana and offered to grant him anything he desired. Vamana requested that he be granted the amount of land that he could traverse in three steps, Mahabali although confused by the minute scale of the request, accepted. Following the request’s approval, Vamana assumed his true enormous size and walked three steps. His first step covered the earth, his second the waters and his third, he placed on top of Mahabali’s head, condemning him to hell. His subjects, however, were true devotees of Mahabali and could not forget their remarkable king so easily, they pleaded with Lord Vishnu to kindly bring him back. Lord Vishnu was touched by the people’s devotion and agreed to allow Mahabali to return to Kerala once every year for 10 days right after the crops were harvested. Mahabali’s return signifies the Festival of Onam, which was celebrated at The Banyan this year. This story, illustrates a community’s love for a king who valued inclusivity and social justice for all its subjects. A message that resonates through The Banyan’s reach across India. This astounding display of wire baskets speaks a lot about our clients’ determination and focus. 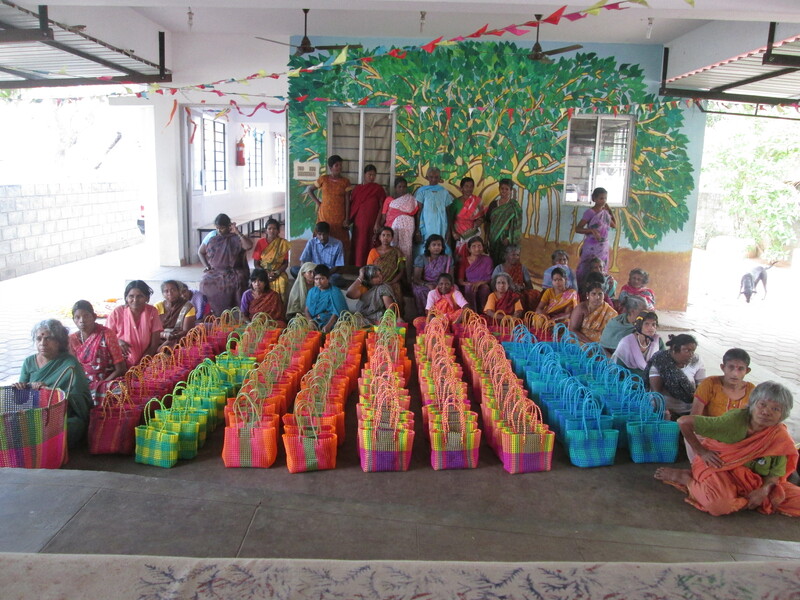 All aimed at fulfilling an order for 200 baskets before the 6th of February, 2014. Mrs. Sashi Naidu, Vocational Training Head at The Banyan’s Health Centre in Kovalam, shares with us the trials and challenges and how the clients made it happen… way ahead of the deadline! “I would first like to say thanks to Mrinalini for giving us an opportunity. Her novel order for the 200 plastic baskets came at a time when we needed it the most. This turned out to be a pilot study of whether our clients are capable of coming together to fulfil a large order…and they did! 200 baskets in just 22 days!